Whenever there's a fire going, I turn cro-magnon. My mind whispers a chant on repeat: "must put meat on fire". So when I first started using the grill, I would do just that - put the meat directly on the fire. This resulted in tough, overcooked, inedible burned mounds. After a few fist shakes to the skies, I did some research and discovered the beauty of two - zone grilling. Use the cooler side to cook your food thoroughly, even tenderize it going low and slow, then use the hot zone to sear your food to perfection. Genius. Now, grilling can turn into a spectacle of a disaster with a crowd of hungry folks - usually slightly inebriated - watching your every move. Embrace your grill by yourself first. Become friends and watch how she wont let you down, once you've figured each other out. Plus, when you grill for yourself, you actually get to eat all the things. That's what I call a win-win situation. 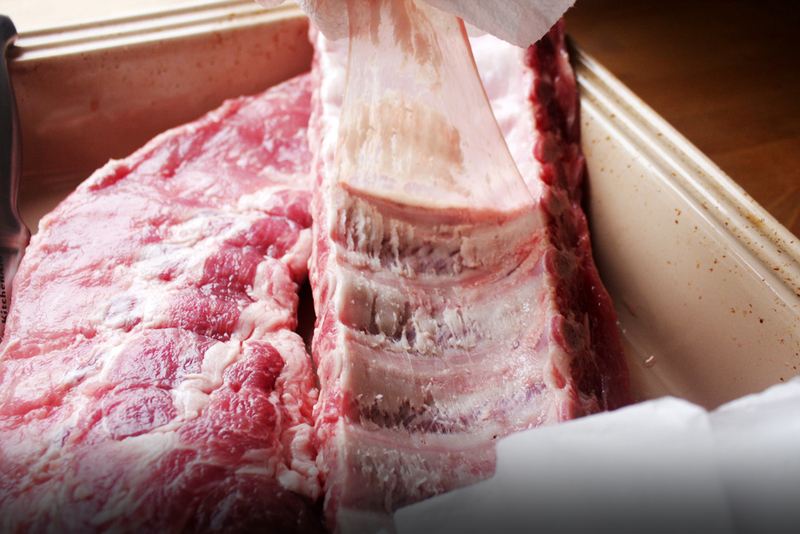 Pull off the tough membrane on the bone side of the ribs with paper towels. 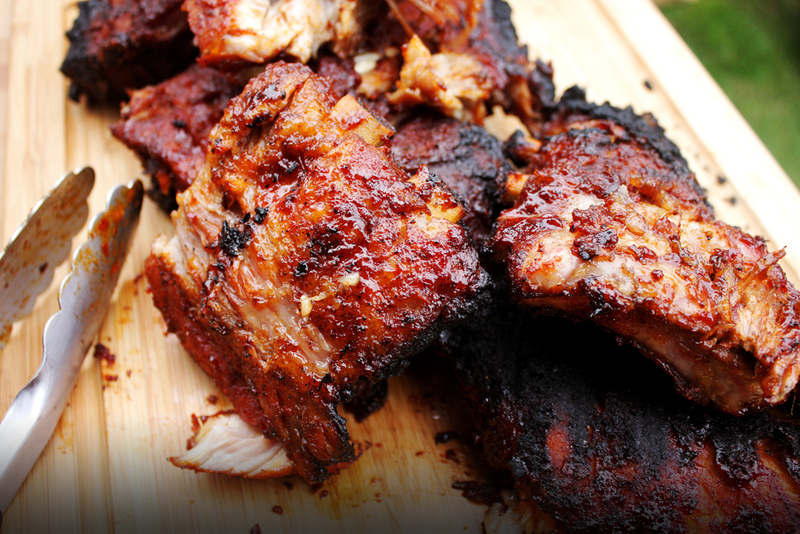 Using your hands, mix the spices and rub all over the ribs. Leave in the fridge at least for 30 minutes, up to overnight. Wrap each rack of ribs in foil. Put on the “cool” zone of the grill for about 3 hours. Carefully take the ribs out of the foil pouches and brush BBQ sauce on them. Put on the "hot" zone of the grill for about 5 minutes each side, depending on how charred you want it. Serve hot with a grilled veggie salad. I've honestly only learned about this cut of beef recently. It was on sale for about 5 bucks, half off, and had a name I'd never heard before. After some research, I figured out that I have eaten beef top round quite a few times, but have also slow cooked the heck out of it since it's a tougher piece of meat. Well there's another thing you can do with a london broil: use a flavorful marinade, quickly broil or grill it so there's no overcooking, then slice as thinly as possible across the grain to ensure as much tenderness as possible. I turned to staples I already stock my pantry with for the flavor bath. Soy sauce is the main star, but I also only used black pepper to make it spicy ... meaning don't use the same amount I put in the recipe if you always decline the Spice Goddess' invitation to party time. That's right. Part one means there will be a second and third way I show you how to make tofu into something delicious, that proudly can be served as a main dish. My husband has been a vegetarian for many years now. This is after I decided we were going on a whole foods cleanse with advice from the Oprah show, and he realized his body was meant to be vegetarian, and I realized my body needed Korean Short Ribs STAT. I grew up eating tofu, but never thought about making it a main dish. In desperation to make something for the vegetarian hubby other than a salad, I starting experimenting with different options. This is perfect for a summer barbeque where hot dogs are usually king. I love me some short ribs. This is on my "last meal" menu item for sure. I'm going to make a bold statement and say that Korean recipes are pretty killer when it comes to marinading meat. The right salty/sweet combo and ingredients like garlic - lots of it, duh - that tenderize into perfection. This is simple to make, with the marinade doing most of the work for the flavor and texture. This tastes great when cooked in a pan like I did for this post, but is also amazing on the grill. Because Koreans ... we know what's up when it comes to bbq-ing. With the husband being vegetarian, I rarely put bits of meat into dishes anymore for flavoring ... mainly out of convenience of not having to make two separate meals. So when I am going to eat meat, it's the star of the show. Usually I'll go for the rib-eye or chicken thighs and of course the flavorful bone-in pork chop. I feel like adding a velvety dark glaze to this dish gives proper admiration to the chops. And the soft onions become a more than welcomed topping. Since we eat with our eyes first, this winning combination may bring jealousy among observers that you're not sharing with. Proceed with caution.